Spidercon, Spidercon – does whatever a ... wait, what am I doing here? The Spiderweb Salon, a local writer/artist collective, invited Revenge of the Star Survivors to take part in their "Spidercon" event in June. I was not really prepared for what I found when I beamed up to the city of Denton, though. The event was billed as "D&D meets comic-con meets star wars meets meets your strange cousin's weird alien abduction stories." Which, in an alternate universe, could actually be a terrific blurb for Revenge of the Star Survivors. -- A host dressed as a giant spider. -- A Spider-man reading space poetry. -- Creepy arts and crafts. -- A man dressed as a priest giving instructions for what I think was cake-and-computer communion. -- A really well done re-enactment of Dr. Horrible's Sing-Along Blog. -- Ethereal singing and snapping. -- Nationally respected science-fiction writers reading from their work. -- One of whom was dressed as Wonder Woman. You can see a bunch of great photos over on the Spiderweb Salon Facebook page. You can also a sense of it from this report on KERA. Where did I fit in to this Mos Eisely-like gathering? 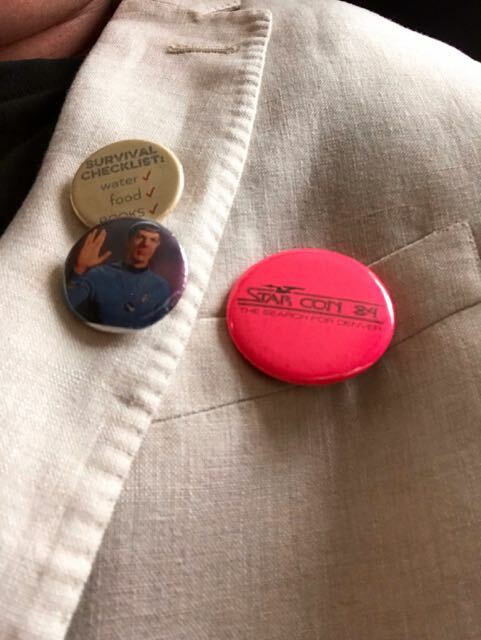 Well, aside from having what surely was the oldest con-themed lapel button in the room (see below), as I told the crowd – it was incredibly meaningful to me. This was the first Revenge event squarely aimed at people who would understand a theme at the heart of the book: that being a sci-fi loving book nerd might mark you as an outcast, a weirdo, a freak. But it also can give you a welcoming cohort of kindred souls who are willing to embrace you with open arms. Or even tentacles. That's a trade I will make any day. Thanks for having me, Spider-people. By the way, the event took place in the city of Denton. Actual readers of Revenge of the Star Survivors might ask – any relation? To which I would say – yes. And to the city of Denton – it's nothing personal. And one final note: If you have been reading this blog awaiting some kind of actual book news, please stay tuned. I promise to post some.